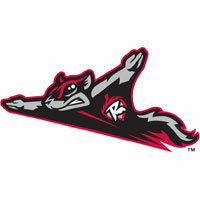 The Flying Squirrels (25-23) squandered a two-run lead by committing three errors in the eighth inning, dropping the series opener against Bowie 7-5 on Tuesday at The Diamond. Richmond out-hit Bowie 12-8, with Miguel Gomez gathering three hits, including a home run, in his return to The Diamond from San Francisco. Richmond continues the brief three-game homestand on Wednesday with an Edgar Allan Poe Bobblestache Giveaway presented by Poe’s Pub (1st, 1000 fans, 15+). Tickets and details for the upcoming homestand in Funnville can be found here. Leading 5-3 heading into the eight, a tricky inning with three errors was the undoing for the Flying Squirrels. Dillon McNamara entered out of the bullpen to begin the inning and easily picked up the first out on a ground ball to shortstop. Corban Joseph then worked a base hit into right field and advanced to third base when Jerry Sands fielded a ground ball at first base, but tossed it into left field attempting to get Joseph at second. Bowie tied the game, 5-5 when Ryan Mountcastle hit a potential double play ball to second. The Squirrels dropped the ball at the base, allowing Joseph to score from third. Ademar Rifaela then connected on the go-ahead hit, a two-run double to left field. McNamara (0-1) suffered the tough loss despite not allowing an earned run (1.0, 2H,3R, 0ER, 0BB, 0K). Bowie reliver Brandon Kline (1-0) picked up the win with 3.1 scoreless innings of work. Kline allowed one his and struck out three in the win. Bowie pushed across a pair of run in the first for an early 2-0 lead. Cedric Mullins opened the game by reaching on an infield base hit to third base and Anderson Feliz followed with a walk. Facing Corban Joseph with two on and nobody out, Anderson speared a comebacker and tossed to second for the force out, leaving runners on the corners. Anthony Santander then singled into center for the game’s first run. Shaun Anderson then struck out Ryan Mountcastle, but an infield base hit from Ademar Rifaela scored Joseph from third base for a 2-0 lead. Santander was thrown out at home also trying to score on the play to end the first inning. Anderson used 23 pitches in the frame. Richmond trimmed the deficit with a run in the bottom of the third. Ali Castillo lined a one-out single into left and Luigi Rodriguez followed with a base hit into right field. Miguel Gomez, optioned from San Francisco to Richmond earlier in the day, delivered an sacrifice fly to make it a 2-1 game. Anderson carved through the Baysox after the pair of runs in the first. The former Florida Gator set down the side in order in the second, third, fourth and fifth innings. Anderson moved the game through the middle innings with ease. The Squirrels tied the game in the fourth inning on a pair of doubles and took the lead on a solo homer in the fifth. Jerry Sands led off the fourth on a booming double to centerfield and Aramis Garcia brought him home with a one-out, two-bagger to right field. Garcia’s seventh double of the year tied the game, 2-2. Miguel Gomez gave Richmond a 3-2 lead one inning later when he drilled a solo shot over the right field wall. It was the first home run of the year for Gomez. Anderson had his stretch of 13 consecutive batters disrupted in the sixth. With one out, Anderson Fleiz worked a walk, beginning the end of the outing for Anderson. Corban Joseph added a single and Anthony Santander followed with an RBI base hit to center, tying the game 3-3. Anderson was then lifted in favor of reliver Patrick Ruotolo. Ruotolo recorded the second out of the inning on a pop up, but released a wild pitch, moving Bowie ahead, 4-3. Richmond responded once again in the bottom of the sixth inning to retake the lead and force Bowie in to the ‘pen. With two outs and two runners on, K..C. Hobson scorched a double into the gap in right centerfield. Hobson’s double plated Garcia and Ronnie Jebavy and gave Richmond a 5-4 advantage. It also ended the outing for Baysox starter Lucas Long. Long worked 5.2 innings and received a no-decision. He allowed season-high 11 hits and five runs while striking out five and not walking a batter. The Squirrels Anderson receives a no-decision despite lasting more than five innings yet again. Anderson worked 5.1 and allowed four runs on seven hits. He walked two and struck out five, using 90 pitches in the effort. Ruotolo went 1.2 innings and allowed jut the inherited runner. Jake McCasland tossed a scoreless ninth inning for Richmond. McCasland allowed one hit in the outing. The Squirrels and Bowie Baysox (Baltimore Orioles) continue the three-game series on Wednesday at 6:35 p.m., at The Diamond. RHP Jordan Johnson (5-4, 3.47) will make the start for Richmond against Baysox LHP Brian Gonzalez (0-2, 1906). Wednesday’s promotion is as unique as they come in baseball. The first 1,000 fans (15+) will receive a free Edgar Allen Poe Bobblestache doll presented by Poe’s Pub. Tickets and details for the upcoming homestand in Funnville can be found here.